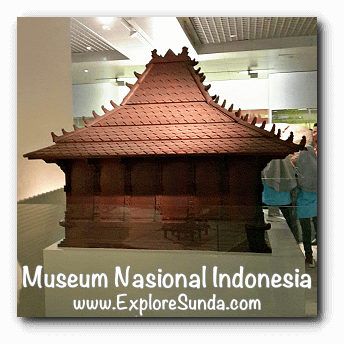 Museum Gajah or Museum Nasional? Are they the same or two different museums? Often people got confused with these name. 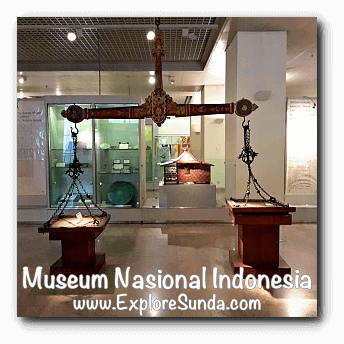 Museum Nasional (the National Museum of Indonesia) is the official name of the museum. 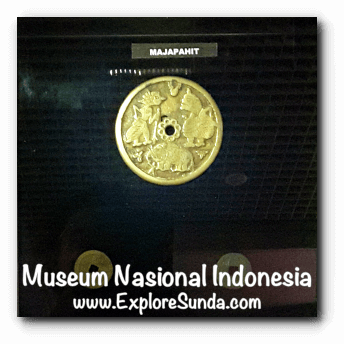 But most people call it Museum Gajah (the Elephant Museum) due to the elephant statue at the front of the museum. This statue is a gift from the king of Thailand: King Chulalongkorn in 1871. Hence, going forward I will use the names interchangeably. 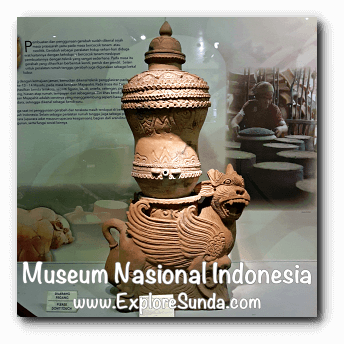 The National Museum of Indonesia is the best museum in Indonesia. Its collections are enormous, which are well preserved in the well maintained building. 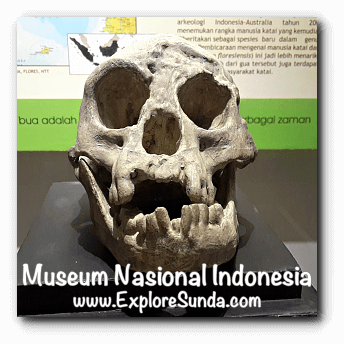 You will not be disappointed going to this magnificent museum. 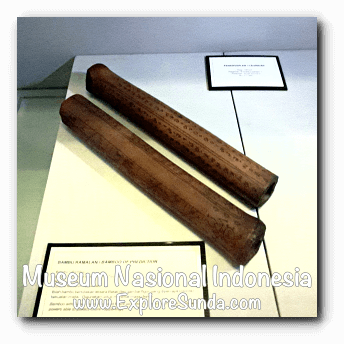 Another perk in visiting Museum Gajah is there are some free tour guides. 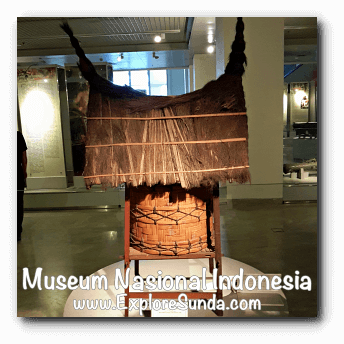 The scheduled tour guides is a program of Indonesian Heritage Society and offered in English, French, Mandarin, and Korea. 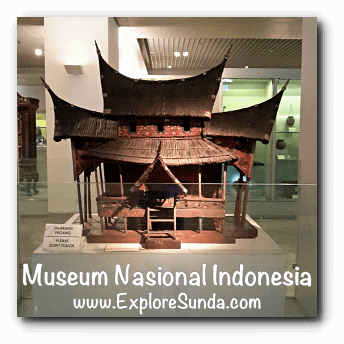 Presently, this museum comprises two buildings: the original building since the Dutch era is called building A or Gedung Gajah (the Elephant Building) due to the elephant statue in the front yard and the new building called building B or Gedung Arca (the Statue Building). The Elephant building is under major renovation for the last several months, hopefully it will be reopened in August 2018. Nevertheless, it is still exciting to explore Building B, the Statue Building. The museum occupies four of the seven floors of the building, full with priceless artifacts! 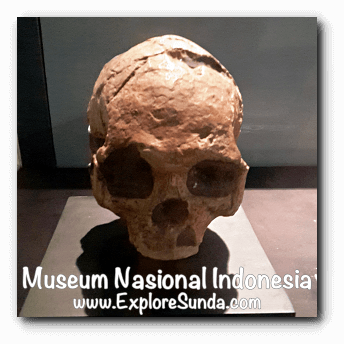 The exhibit of the National Museum of Indonesia starts with the first evidence of human life found in Indonesia, namely the findings of Homo Wajakensis in Tulung Agung, East Java as well as the Horrendous Dwarf of Flores Man, which is believed to be the missing link between Homo erectus and Homo sapiens. 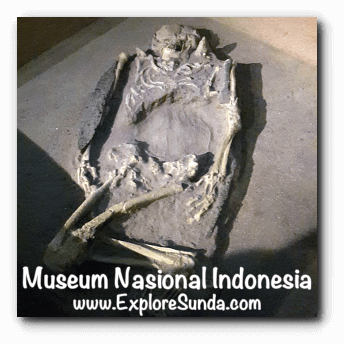 Next is a replica of prehistoric burial site found in Jembrana, Bali. It is fascinated to learn how people treated the deceased at that time, which estimated to be from 2,200 to 1,800 years ago. 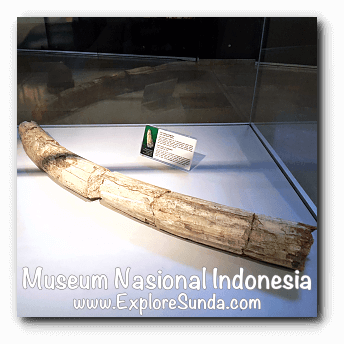 The museum also displays some fossils such as the tusk fossil of Stegodon, the ancient elephant that lived 700,000 to 150,000 years ago in the area of Sangiran, Central Java. The exhibition room in the first floor is rather small compares with the upper floors, since the museum has spacious lobby in front. Going upstairs, we can use either an elevator or an escalator. 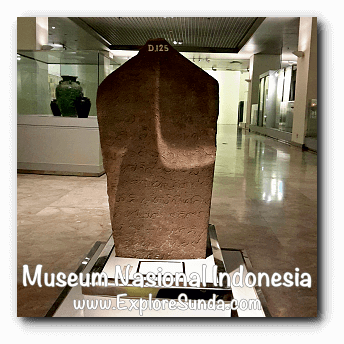 Mind you, it is very rare for a museum in Indonesia to have an elevator! The theme of the second and third floor are Knowledge, Technology and Economy gallery and Social Organization and Settlement Patterns gallery, respectively. 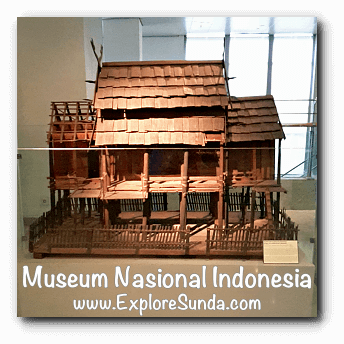 These two floors depict the rich history and culture in Indonesia. 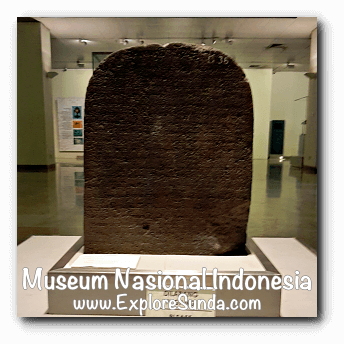 Museum Gajah has vast collection of stone inscriptions, from the very famous king Mulavarman inscription from Kutai, East Kalimantan in the early fifth century to the less known such as Munggu Antan inscription from Kedu, Central Java. 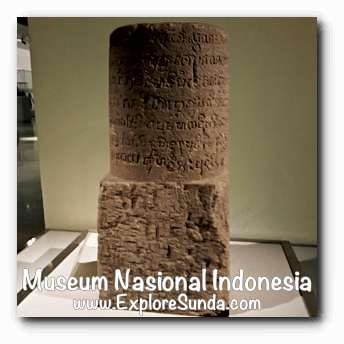 The stone inscriptions were made in many shapes: cylinder, triangle, tower, the original shape of bulky stone, even the Ganesha statue inscription, which was written on an elephant statue! They are written in many ancient languages derived from Pallawa, Nagari and Tamil in India. 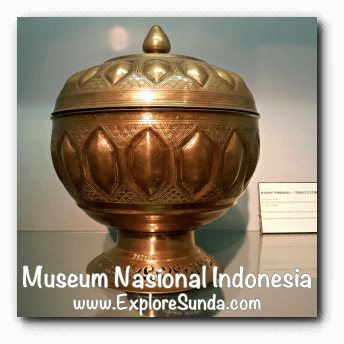 For centuries, there are many small kingdoms to great kingdoms in Indonesia. Each has their own symbols and characteristics. We can see them through the royal stamp and money (usually in the form of gold or silver coins). 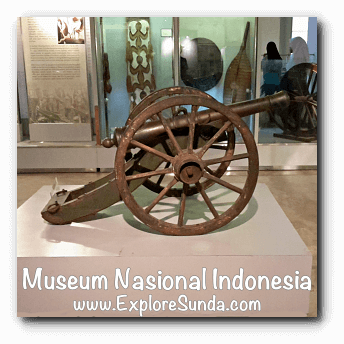 The weapons used in Indonesia vary considerably, from the simple sword, intricate decoration of keris to the European introduced canons, we can see them all here. There are many ethnics in Indonesia, each has their own rich cultural, the most obvious is the traditional houses. Each region has distinctive house. 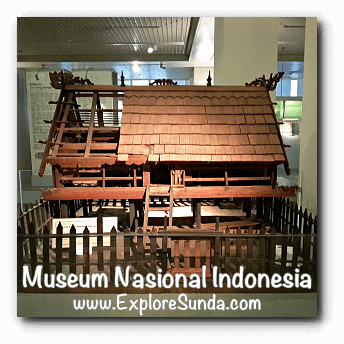 We can see the miniatures in Museum Gajah, while we can find these traditional houses in its actual size in Taman Mini Indonesia Indah. In terms of the technology, we will find many navigation tools here. 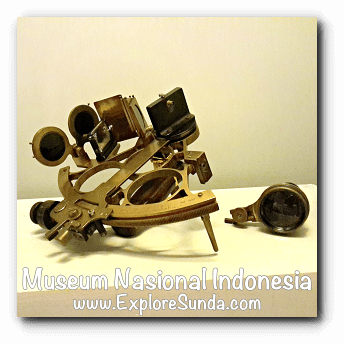 For example, the classic sextant used in calculating the nautical position of a boat and the chronometer used in smaller boats. 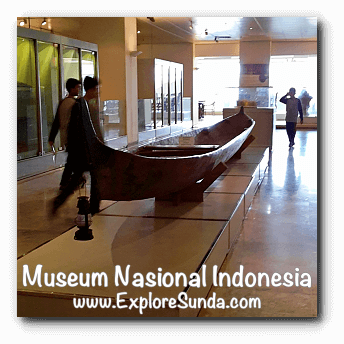 Since Indonesia is a maritime country, each region has different types of boats. Some of the boats are displayed here, both in actual size and the miniature. Many are simple boats, but the decorations are very detailed. 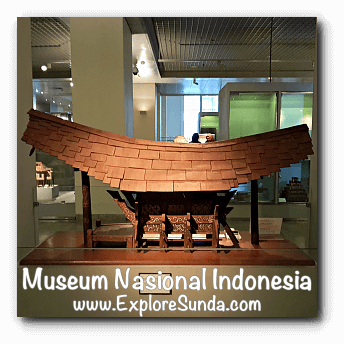 For example, Kora-kora Prau, a traditional boat from Maluku, is decorated with carved woods hemmed with shells. 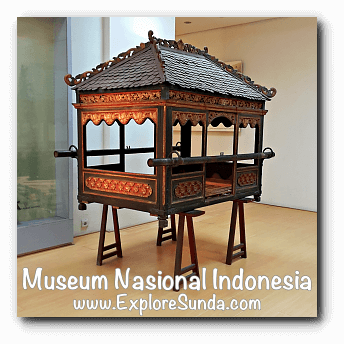 Another means of transportation during the old times is a palanquin. Not all people can afford it, only noblemen and royals use it. Hence, the palanquins are decorated beautifully to display the status of the owner. 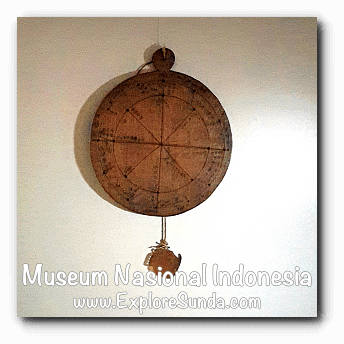 The daily life technology include the Balinese calendar based on Wuku year and predicting someone's future with bamboo of prediction from Batak, North Sumatera. 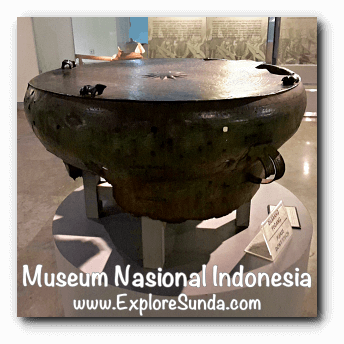 One interesting display is a bronze kettle drum from Rote, East Nusa Tenggara. It is used as ceremonial equipment to call the rain. They also had acquired the technology to create beautiful housewares made of teracotta and metal. 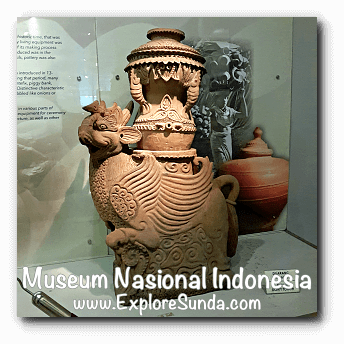 For example, the teracotta water container from Cirebon, West Java, in the shape of singabarong (lion) and paksinagaliman (paksi=bird, naga=dragon, liman=elephant). 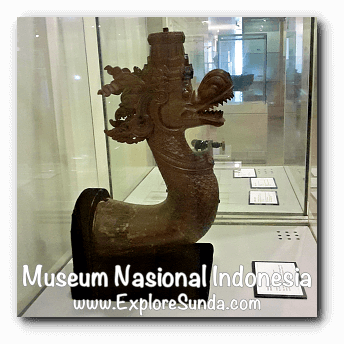 On the other hand, the Suniaraja palace in Cirebon, West Java has a bronze waterspout in the form of dragon. Indonesian used to have a tradition of chewing betel leaf and nut called menginang. It is some type of personal pleasure like smoking a cigarette or pipe. Hence, they usually put all the ingredients in a set of special containers called pekinangan. Common people used containers made of wood or bamboo while the nobles and rich people used containers made of gold or silver. Do you know how much people pay tax to the king in the old time? The answer is depend on how heavy is the king! 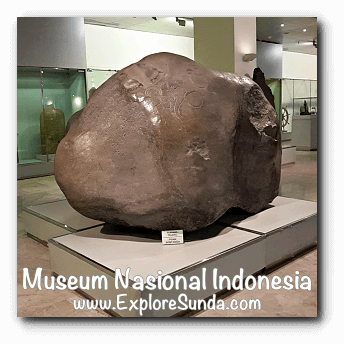 In the middle of the room lays a giant scale from Sultanate of Banjarmasin, South Kalimantan. The tax was paid in the form of crops the people grew and harvested. The Sultan would purposely sit on one side of the scale and the crops he received had to be even with his weight! We can only reach the fourth floor through the elevator. It is also called as the Treasury Room since it contains the museum's collection of gold and ceramics. Unfortunately, we are not allowed to take any picture in this floor. The ceramics are safely put behind glass walls. They are grouped based on the origins and the era they were made. The oldest porcelain I could find there was from Han dynasty in China, dated approximately 206BC-220AD. Their color is plain white glaze. It seems each era has their own distinctive color. The ceramics from Song dynasty in China was grayish, while green was the preferred color in the Yuan dynasty. Finally, Ming dynasty (1368-1644AD) painted blue drawings on the white background like the ones we usually see. Next is the treasury room. Most of the exhibits here are made of gold and decorated with precious stones. 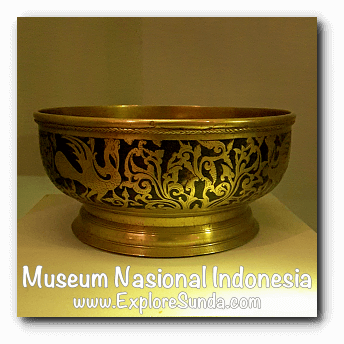 They originated from Wonoboyo treasure, Muteran treasure, and royal heirloom from the kingdoms all over Indonesia. 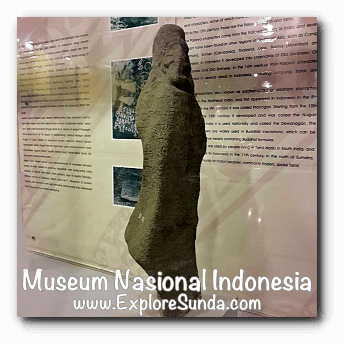 The Wonoboyo treasure is one of the most significant archaeological discoveries in Indonesia. They found five big ceramic jars from Tang dynasty (618-907AD) and one large round bronze container. They found jewelries, personal decorations, ritual vessel and coins weighed 35 kilograms inside these containers, including 6,396 gold piloncito coins and 600 silver coins. 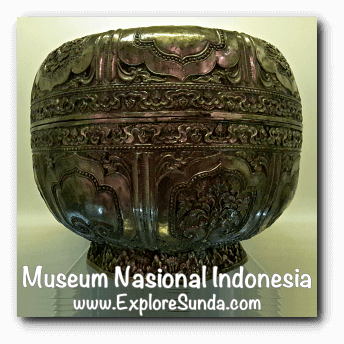 Then there is Muteran treasure found in Mojokerto, East Java. They found jewelries and ceremonial objects made of gold and silver inside a metal containers. The archaeologists estimated they were made in 775-825AD. In addition to those two treasures, this room also displays royal heirlooms. 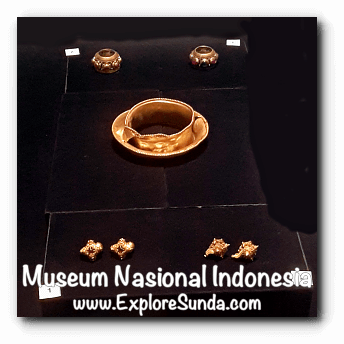 For example, a gold crown decorated with precious stones from Banten, keris Joko Piturun from Madura, keris baru sembah from South Kalimantan, pekinangan (a betel chewing set) from Palembang, not to mention various wedding and dancing jewelries as well as the ceremonial objects. They are all made of precious metals and precious stones. 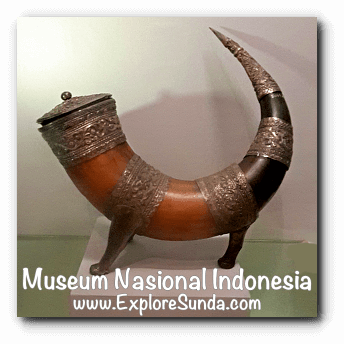 Museum Gajah is located on jalan Medan Merrdeka Barat no. 12, Jakarta. 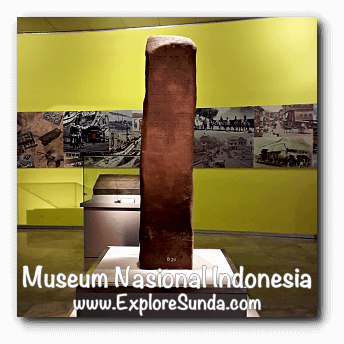 It is on the west side of Merdeka Square where Monas (National Monument) is. Many TransJakarta buses stop right in front of the museum entrance, you only need to get off at Monas bus stop. The free city tour buses also stop in front of the museum entrance. You only need to get off at Museum Nasional bus stop. 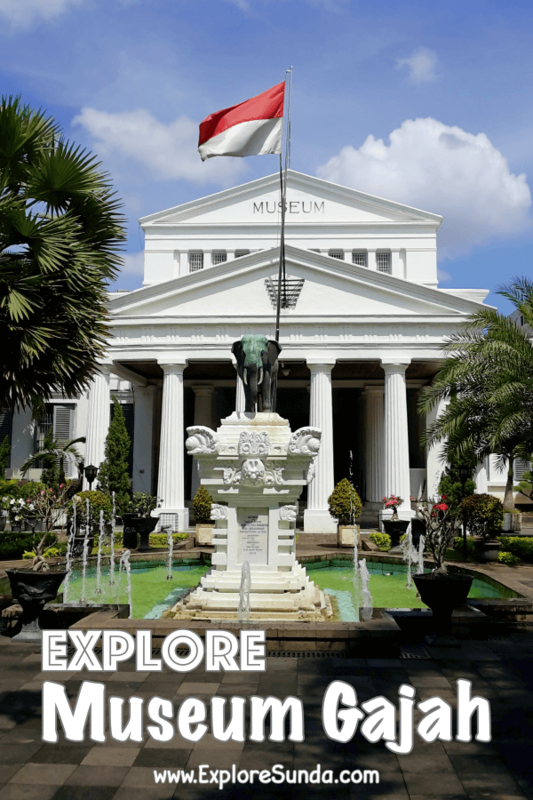 You can use taxi and app-based transportation such as Grab and Gojek, just remember they might be more familiar with Museum Gajah instead of the official name of Museum Nasional. If you drive your own car, there is parking lot in the basement of the museum.